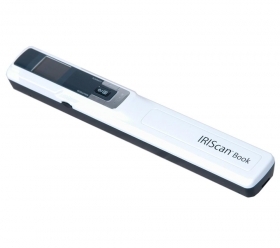 IRIScanTM Book 3 is a portable scanner that allows you to scan books and maga- zines anytime, anywhere and without ripping pages off. Simply roll your way across the document, and your scan will be saved automatically into the provided MicroSDTM card and ready to be transferred into your PC or Mac. Once back at home or in the office, the scanned documents are automatically turned into editable documents by I.R.I.S flagship OCR software ReadirisTM Pro 12. - Cordless, battery-powered and very lightweight. Carry it anywhere! - Ideal to scan books, magazines & newspapers. - 300/600/900 dpi scanning resolutions. - Scanning speed: 2 sec. for a B&W document/ 3 sec. for a color document. - Directly scan to PDF and JPEG. - Save scans onto the MicroSDTM card (included). - Powered by 3 AAA alkaline batteries (included). - Convert any paper document, PDF, or image file into editable Office documents (Word, Excel, Outlook, etc.). - Worldwide OCR solution - 137 recognized languages (incl. Asian and Arabic!). - Create hyper-compressed PDF files, ideal for archiving and sharing via email.